Reading Rob's recent post on his pet skunk Cyranose I began thinking about my own favorite undomesticated pet. When I was in 5th grade our teacher lived on a farm. This was extra appropriate because my school, Burgundy Farm Country Day School, was a working farm as well (this is cool, they have their own Wikipedia page). Because of her love of animals we had a couple of our own throughout the year. We got to raise a pig that had been born on her farm. We had bunnies (when they had a litter I remember guying one for $5. Nibbles was a great pet rabbit for years). We had snakes, two great black snakes we got to feet mice each week. We had mice which happily bred and got fed. . . to the snakes. We had two rats as well. This class, more than any, taught me that animals aren't to be feared, take responsibility and care, and that almost any animal can be a pet. I continue to have a hard time understanding people who think any pet is "weird". The best animal we had though, was a squirrel she had rescued and been nursing back to health named Scrabble. This was the most memorable and, to this day, the pet I remember as being the most special. Scrabble and I shared a common bond. . . not many people liked us. He would bite pretty much anyone. I remember having him on my desk during class once, my arms circled around him so he wouldn't jump off, and hi bit me. I wasn't the first, I think he'd bit other people. Generally though he would bite and people would them avoid him completely. He bit me, sure, but I never stopped playing with him. I remember, vaguely, having him on my shoulder at times. He was so much fun, and so unique. This was, without a doubt, the best pet I'd never owned. 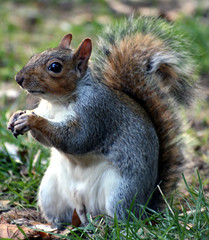 If I could convince my wife, I'd definitely get a squirrel for a pet. Unfortunately she won't even allow snakes in the house, so I think I have an uphill battle. In the meantime though I guess I'll just begin leaving peanuts out and attracting as many squirrels to my back yard as possible. What's the best pet you've never owned? My MIL saved a chipmunk - it was dying and she nursed it back to health. Now, it's their pet. Daisy the chipmunk lives in a habitrail thingy - remember those things for hamsters back in the day? We had all kinds of animals growing up, but my favorite memories are of Muffin. My parents had her for a while before I was even born. She used to follow my mom around everywhere. And she would play with us all the time - what a great dog.